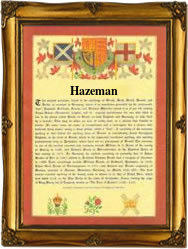 Recorded as Hayman, Haysman, Haseman, Haisman and Hazeman, this is an English surname. It has several possible origins. It may be occupational and describe a hay merchant, or it may be topographical and descripe a person who lived by an area of land fenced for agriculture. This is from the Olde English pre 7th century word "haeg", the later Middle English "haye", plus the definitive suffix "-mann", to mean a variety of status from friend to man(ager). In this context it may describe an official in charge of protecting land or forest. Another possible source is from the Middle English word "hay", meaning tall or high, and here used as a nickname for a very tall or possibly very short (!) man. William Hayman was an early emigrant to the New World. He left the port of London in 1634 bound for the island of Barbados. Other recordings include those of Martha Haseman who married John Russell, at the church of St Benet Fink in the city of London on June 28th 1622, and two centuries later Mary Ann Haysman, who married Henry Manning at St Dunstans in the East, Stepney, on October 30th 1858. The first recorded spelling of the family name may be that of William Hayman. This was dated 1312, in the "Catalogue of Ancient Deeds", for Devonshire, during the reign of King Edward 11nd, 1307 - 1327. Throughout the centuries, surnames in every country have continued to "develop" often leading to astonishing variants of the original spelling.